The shoulder is a highly mobile joint that sacrifices stability for an increased range of movement. As a consequence of this trade off, dislocations are common, with an incidence of up to 1.7% in the general population. Shoulder dislocations account for over half of major joint dislocations which present to emergency departments; if not managed correctly they can lead to chronic joint instability and pain. The most common type of dislocation is anteroinferior (usually just termed ‘anterior’), constituting around 95% of shoulder dislocations, with posterior and inferior dislocations making up the remainder. An anterior dislocation is classically caused by force being applied to an extended, abducted, and externally rotated humerus. Posterior dislocations are typically caused by seizures or electrocution, but can occur through trauma (a direct blow to the anterior shoulder or force through a flexed adducted arm). 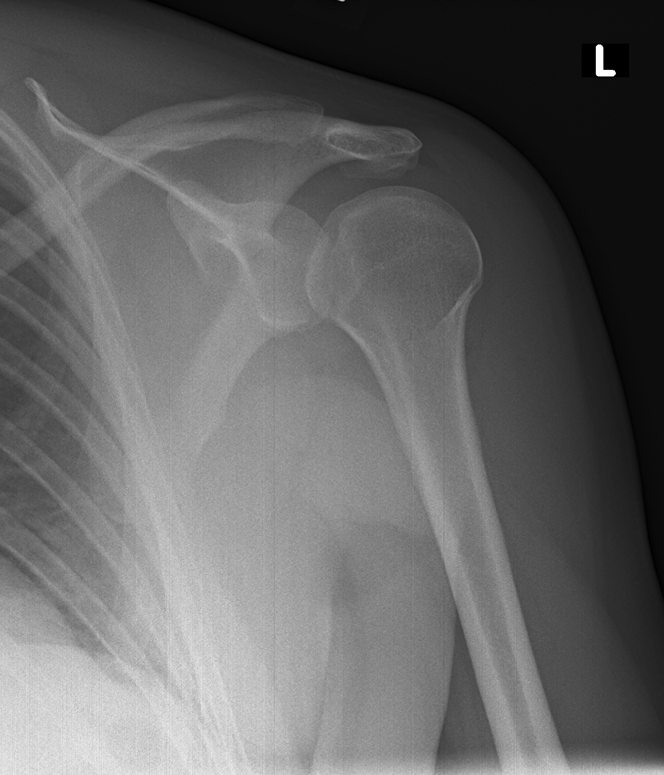 Importantly, posterior dislocations are the most commonly missed dislocation of the shoulder, especially as the radiographic evidence of them can often be subtle. All dislocations present with a painful shoulder, acutely reduced mobility, and a feeling of instability. Patients will be reluctant to move the affected limb. On examination, there is often an asymmetry with the contralateral side. Often there is a loss of shoulder contours (from a ‘flattened deltoid’) and an anterior bulge from the head of the humerus may also be seen. It is important to assess the neurovascular status of the arm, which can become compromised in some cases, especially the axillary and suprascapular nerves. Anterior dislocations can usually be spotted on the AP film as it is visibly out of joint, the Y-scapular view also will confirm that it is anteriorly dislocated. Remember, it is important to check for concurrent bony injuries too, as discussed above. 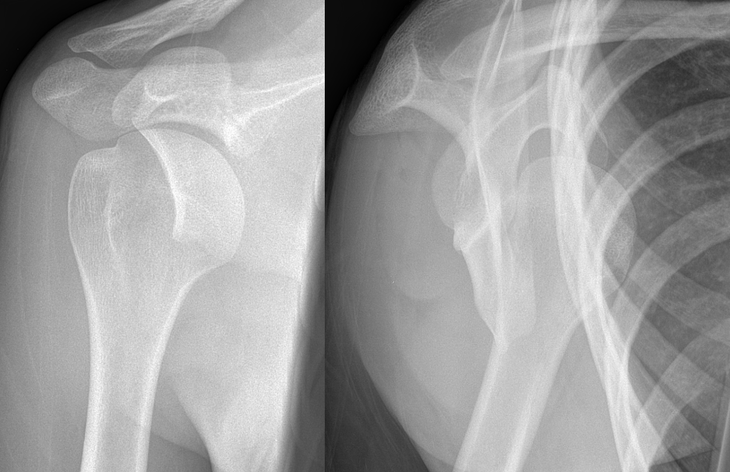 The ‘light bulb sign’ suggests posterior dislocation (Figure 3), as the humerus is fixed in internal rotation. The Y view is very useful for differentiating between anterior and posterior dislocations. If labral and rotator cuff injuries are suspected, an MRI of the shoulder may also be warranted for further investigation and classification. Management should initially be an A to E trauma assessment of the patient, as dislocations frequently occur following trauma, ensuring to also stabilise and examine for other injuries. Provide good appropriate analgesia, as this will aid in definitive management of the dislocation too. As with most orthopaedic conditions, the principle is reduction, immobilisation and rehabilitation. For shoulder dislocations, a closed reduction, such as the Hippocratic method, should be performed by a trained specialist, involving orthopaedics early before attempting any reduction. Ensure to assess the neurovascular status both pre- and post-reduction. Any failed closed reduction may warrant attempted manipulation under anaesthesia in theatres. Once reduced, the arm should be placed in to a broad-arm sling; the length of immobilisation is still controversial for anterior dislocation; typically 2 weeks is used, however longer may be warranted for posterior dislocations. All dislocations require physiotherapy aiming to restore range of movement, functionality and to strengthen the rotator cuff and pericapsular musculature. Future surgical treatment may be warranted for recurrent pain, instability, large Hill-Sachs defects, or large (bony) Bankart lesions. Despite treatment, chronic pain, limited mobility, stiffness, and recurrence are possible; unfortunately, recurrence is still relatively common, particularly in those who continue high risk activities. Other common complications include adhesive capsulitis, nerve damage, and rotator cuff injury is common and may require surgery. Degenerative joint disease can occur, typically after labral and cartilaginous injuries and chronic recurrence. 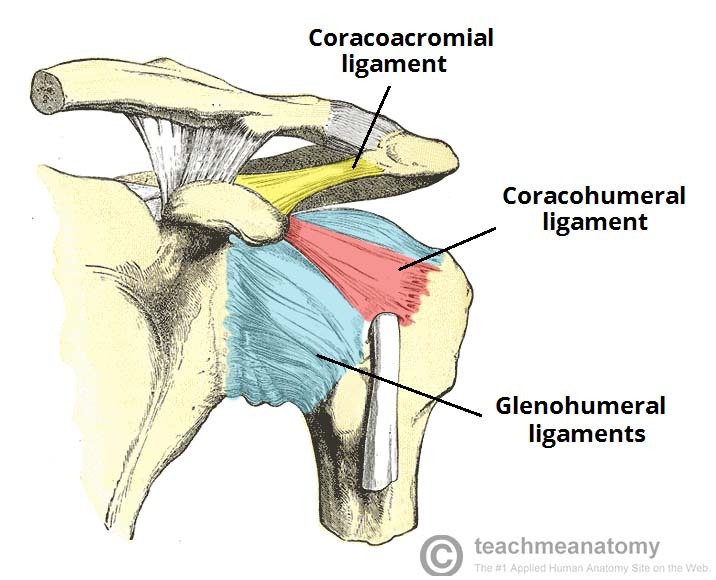 What is the most common type of shoulder dislocation? Which peripheral nerve is most at risk from an anterior shoulder dislocation? What is a bony Bankart lesion?